You can take part in a race by adding your cyclists in your teams tactics for that race. You will find those team tactics in the calendar. For every participating cyclist you'll have to pay 1000$ participation fee. Choosing the leader: the more Leadership skill, the more tactic points to your disposal. 1. "Save Fitness": The cyclist with this order won’t take any initiative during the entire race. This tactic is opportune when the cyclist does not really pursue a good overall ranking in a tour, but rather aims for that specific race victory later on. He will only lose 1% of fitness. 2. 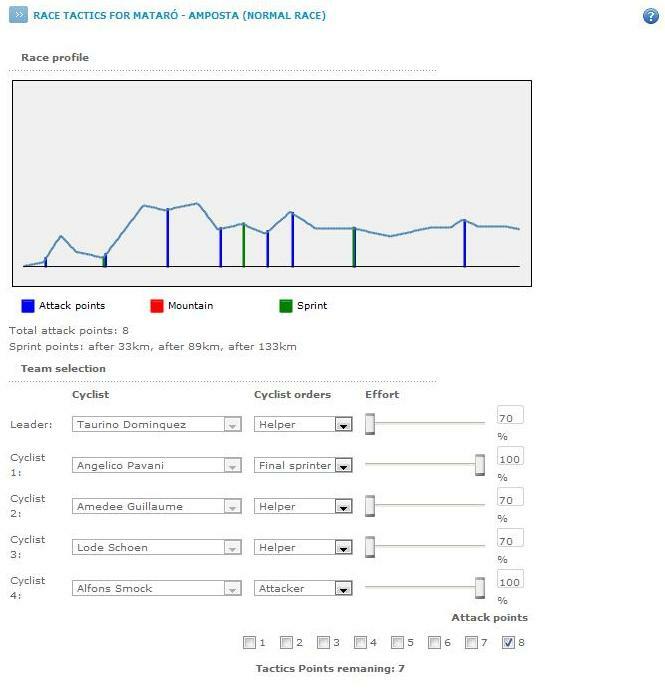 "Attacker": The cyclist will attempt an attack on one or more predefined points during the race. When a cyclist attempts an attack, he will first perform a break-away ('demarrage') to create an initial gap. For this break-away the cyclist needs a sufficient Sprint skill. In the attack he will need sufficient Time Trial Skill. Ofcourse the terrainskill is also important : attacking on a mountainpart with a cyclist with poor mountain skills is quite useless. 3. "Helper": This task is given to cyclists that you want to concentrate on helping your attacker(s) and/or final sprinter. When a cyclist has a flat tire or a fall and he has enough helpers in his group at that time, these helpers will guide the cyclist back to his group without any time penalty. A helper will also help his team mate(s) to overcome a bad part of the race. When there is for instance a strip of hill and one of your cyclists only has poor hill skill, the helpers will surround him and try to keep him in the group. The more helpers in the group, the more effective their influence is and the better a lower skilled cyclist can hang on to them. Helpers also actively tend to keep the peloton speed as high as possible. Together with other team mates having that same order, but also together with the helpers from the other teams he will form a line ('echelon') at the front of the peloton, boosting its speed. When a teammate is in the attack, the helpers will not help in increasing the peloton speed. 4. "Final sprinter": An order you would use when you are aiming for a mass sprint at the end of the race. A cyclist with this order will stay in the peloton during the race, but will unleash his remaining powers during the final field sprint. His Sprint skill will be boosted when he approaches the finish to make a final kick or anticipate on another final sprinter’s jump. Like in real life cycling, the helpers will form a line and try to bring their final sprinter in the best possible way to the final field sprint. The more helpers your final sprinter has, the better he will be positioned for the sprint. • Every cyclist will start the race in the field (‘peloton’). • The speed of this peloton will depend mainly on the combined skills of the helpers but every other cyclist in the peloton will have a smaller contribution to the group’s speed as well. • A cyclist can only break away from the peloton by attacking. No matter how good his skills are, he will stay in the peloton when he does not attempt an attack. • The speed of a group will mainly be determined by the combined terrain skill of all the members of the group for the terrain of the strip they are on. On top of that, and depending on the size of the group, the time trial skill is also of importance. A single rider will have to face the wind and weather all the time, and therefore cannot hide behind another cyclist’s back. In those circumstances, he needs to be a sufficiently skilled time trialer to keep up a constant pace. However, in a more extended group, the cyclists can draft behind one another, forming an echelon, and as such the individual time trial skills will be of less importance for the pace of the entire group. • Just like in real life cycling, when the race is nearing the end, the peloton will increase the pace and spin harder and harder to get the final sprinters in the best positions or because they think they still can successfully chase the last group of escapers ahead of them. • Intermediate sprints are handled as in real life, i.e. you don’t have to elect point sprint or mountain sprint cyclists anymore before the race starts. The one that reaches an intermediate sprint first, will get the most points, and so on. If a group of cyclists has reached an intermediate sprint they will sprint for the points. • Flats and falls will cause you to loose a fixed amount of time, which is independent of the terrain you were on when it occurred. Remember that helpers in the same group might overcome the disadvantages of a flat or fall. The race results are calculated at 13h00. Experience : the higher the skill, the better your cyclist performs. In single races there's a maximum of 100.000$ victory bonus awarded (in first division). However, you won't always win the full amount because it is dependent on the number of participating teams.